There is much to be said about this group and in fact, much has been written, both in the way of books and articles. The beliefs found within these loose-knit groups angers me for its abuses, intellectual myopia, and a severe lack of biblical integrity. In short, I fully and firmly believe – based on my understanding of Scripture – that any form of Dominionism, Kingdom Now, New Apostolic Reformation, and the myriad of other names it comes under – is full-on heresy. I understand how strong that word is, but the difficulty is that people can easily get caught up into aspects of it without realizing it. Before they know it, they are being moved away from the Great Commission, which has always been about saving individual souls and onto the highway of Christian Reconstructionism, where the emphasis is on rebuilding America under God. If you’ve read my previous four-part series on end times prophets, it will help you to know that even though they might disagree with one another in certain respects, they all still fall under the same larger umbrella known as Dominionism or Kingdom Now, etc. This umbrella appears to morph itself into what is needed at the time depending upon the group it is trying to reach. In other words, aspects of Dominionism can be found in many denominations, sects, and groups within Christendom. Beyond this, Dominionism tends to connect with and pull from politics and even the New Age. Dominionism itself is seen by proponents as the religious glue that ties most things in society together in its efforts to create a society that will allow Jesus to return. Give that some thought for a moment and consider the ramifications. There are people today from many walks of life – religious, political, secular – who all believe that society is being directed toward a new age, an age where a “Christ” will become manifest and once that occurs, any remaining wrongs in society will be righted. Before this Christ can appear though, it is strongly believed that the Church must move in concert to gain control of main areas of society that have been subverted by the enemy. This is why someone from the “signs and wonders” group can hobnob with someone like Rick Warren. The overarching goal remain the same and that goal is to “conquer” or regain lost dominion over this planet, all in the Name of Christ. In other words, God needs our help. He cannot do it by Himself. Because of this, the people from the religious arena involved in some form of Dominionism have little to no difficulty working with politicians, secular agents, and people from opposing religions if need be because the overarching agenda is simply to reach the stated goal. The goal is found within the tenets of Dominionism. But let’s start with the basics. …man lost dominion over the earth when Adam and Eve succumbed to Satan’s temptation in the Garden of Eden. God “lost control” of the earth to Satan at that time, and has since been looking for a “covenant people” who will be His “extension,” or “expression,” in the earth and take dominion back from Satan. This is to be accomplished through certain “overcomers” who, by yielding themselves to the authority of God’s apostles and prophets for the Kingdom Age, will take control of the kingdoms of this world. These kingdoms are defined as all social institutions, such as the “kingdom” of education, the “kingdom” of science, the “kingdom” of the arts, and so on. Based on that definition, one could see why many of these folks believe that God ultimately rejected Israel and refuses to deal with them again as a nation. Now, He works only through His Church. Please note that at its core, Dominionism (and its offshoots) espouses the belief that God “lost control” of His Creation. When Adam and Eve sinned, they essentially gave control over Satan. On one hand, Satan received something when Adam and Eve failed through disobedience. Satan received some control of earth, but not total control of it or God’s Creation. God has always been and will continue to be sovereign. Biblically, there is absolutely no doubt about that and like aberrant theologies such as Amillennialism (which teaches there is no literal upcoming Millennial Kingdom reign of Jesus directly on this earth), the only way to arrive to such a heretical conclusion is by changing the meaning of Scripture. This is normally done by taking things metaphorically that should be taken literally. Please note, I’m using the word “literally” here, not literalistically. Because of God’s supposed loss of control, He is limited in what He can accomplish here on planet earth (since Satan is now the “owner” of the earth). If one stops to consider it, this is one of the most pitiful excuses for theology even because of how badly it denigrates God at every turn. If God was that limited, how would He have managed to complete His work through God the Son’s birth, life, death, resurrection, and ascension? In fact, it is patently clear that Jesus accomplished everything He was given to accomplish by God the Father. This is very clear throughout the New Testament. He fulfilled all the Old Testament prophecies concerning Himself as well as upheld all aspects of the Mosaic Law. Yes, in some cases, Jesus was “limited” from doing certain good works but that was solely because of people’s personal lack of belief where they themselves were concerned. The people failed to believe and because of it, either failed to gain salvation, healing, or both. That was a personal problem they had and while it could have been fueled by the enemy, those people still had free will. Instead of choosing Christ, they rejected Him, which is the same thing that happens today repeatedly with people. Jesus did not fail at ANY point in all of the things He was required to do. Not once, which then allowed Him to offer Himself as a propitiation for our sin – yours and mine. We still have to choose to embrace that salvation though, don’t we? The problem with today’s Dominion movement is that, through terrible exegesis, the responsibility for turning this planet around falls not with God, but with people. In that way, proponents of Dominionism severely limit God. There are other names that can be added and surreptitiously, what is most astounding is that some of these groups (and others not listed) are seriously involved in politics and political campaigns. After understanding the main focus of Dominionism, it is easy to see why these groups have moved into politics and most other areas of society. Clearly, in order for them to gain and maintain control and see the type of change they wish to see, they must have at least some control over the political realm. This is why some groups within Dominionist camps are comfortable reaching out to just plain ol’ “conservatives,” “patriots,” and the like. Those folks don’t have to be clear-cut Christians. In fact, if you live in the southern portion of the United States, being a conservative or a patriot is often thought to be synonymous with being a Christian and visa versa. 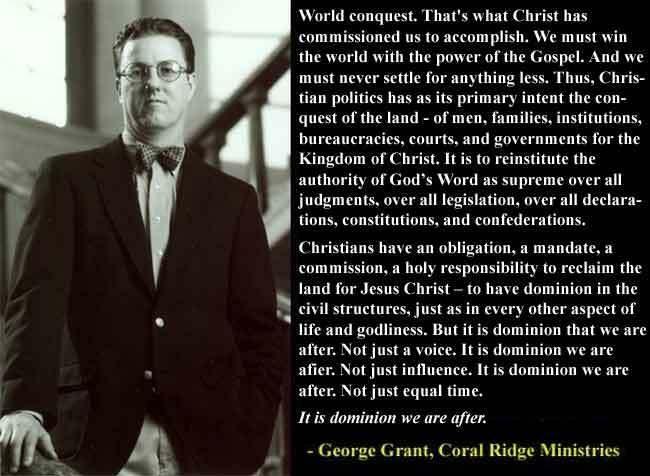 The goal of Dominionism – first and foremost – is to change the fabric of American society so that control is “wrested” back from Satan and the world he currently is believed to fully control. I believe that Satan is in control of much that occurs in this world, but only because God allows Him that control, not because God has no choice in the matter. Satan did not “win” control of this planet or God’s Creation when our first parents sinned. He gained some semblance of a victory and at once began to assert himself into God’s Creation. Why? Because of Isaiah 14 and the promises that he originally made there ending with his promise to be “like the Most High,” (v. 14; the reasons for his fall from grace). That has been his goal and God has been allowing Satan to bring it to fruition. Satan will have that opportunity to “rule” the earth for a very short time through his upcoming spiritual “son” (Antichrist). The Bible highlights this repeatedly but people in the Dominionist camp refuse to accept that truth as literal truth. Instead, they allegorize things away or argue that it might happen if people do not get in gear and wrest control back from Satan. These people are deluded unfortunately and amidst all their work and effort, they really don’t care about fulfilling the Great Commission. It’s control of this planet they want because in that, they believe Jesus will then be “able” to return to this planet as Sovereign. In order for Satan to become ruler of the world (through Antichrist), the entire world – that includes America – must become part of the New World Order (the last phase of the fourth empire of Daniel 2). Frankly, I believe those involved in the Dominionist movement will actually wind up being part of the religious Babylon that comes of age during the coming Tribulation period. Folks, the God I worship is sovereign, now and forever. We’ll see how Dominionism is simply one huge distraction from God’s purposes and more on this subject next time. Entry filed under: christianity, Cultural Marxism, Emotional virtue, eternity, Global Elite, israel, new age movement, Political Correctness, Politically Correct, Politics, Religious - Christian - End Times, Religious - Christian - Prophecy, Religious - Christian - Theology, salvation, second coming. Tags: charismatic renewal, dominionism, george grant, kingdom now, latter rain, new world order, religious babylon. Excellent article. Rousas John Rushdoony (“The Father of Christian Reconstructionism”) also deserves a mention, as does his son-in-law Gary North, and the theonomist “Chalcedon Foundation”, publisher of the Journal of Christian Reconstruction. Thank you, Steve. Yes, I’ll be getting to those guys 🙂 I appreciate the reminder though. I won’t remove your comment but I’ll certainly let this one stand as well. Thanks Mary and God bless. Feel free to take the time to explain why you changed your mind, Mary. Fred, I totally agree with you. And thankfully, you agree with my thinking. ‘These’ are stealthy and we have put on a heavenly pair of 4D glasses. Message: God does not need our help! But God wants our obedience, humility, repentance and surrender to His power. And the Glory is all His. I can’t believe I even had to read or write that. His ways are WAY higher than our ways.